Most people experience the feeling of being anxious in small moments as a natural part of life. When you are late for work because of heavy traffic, have a big meeting coming up or are going on a first date you might feel a bit anxious and worried. However, others might find that their anxious feelings become overwhelming and make it hard for them to function in their daily life. It is unrealistic to expect that as human beings we should never feel anxious. We have a natural physiological stress response to situations that we feel could be potentially negative or unpleasant. Someone in good mental health can experience anxiety but find ways to cope with it so that it doesn’t prevent them from doing things that they need or want to do. Whenever anxiety escalates or becomes unmanageable, it could be a sign of a disorder. People can have trouble distinguishing between what could be normal nervousness and the kind of anxiety that requires treatment from a professional. 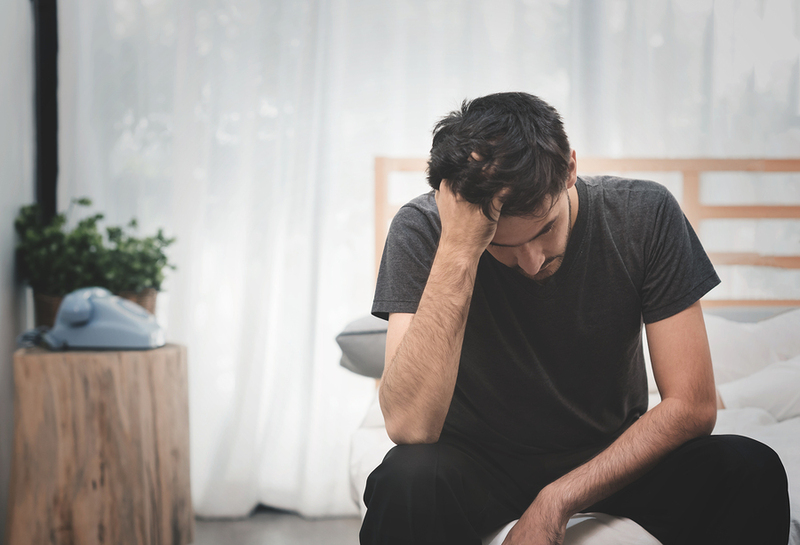 Understanding the symptoms of a real anxiety disorder can help you determine if you have moderate levels of anxiety or if you need to see a therapist. In our daily lives, anxious feelings can actually be good thing that help keep us safe and driven. It can help us stay motivated to study for a test, prepare for a meeting or try to make a good first impression. They can also act as a warning signal if there is something dangerous or a real threat that we need to be ready to face. When anxiety is an occasional occurrence and it acts as a driving force to accomplish tasks then it is not something to be concerned about. However, when anxiety takes over your thoughts on a daily basis and begins to disrupt aspects of your life then it becomes a problem. Someone who has anxiety tends to have irrational fears that are not always related to specific situations that would warrant an anxious feeling. One of the main differences between feeling anxious and having anxiety is that someone with a serious anxiety problem can no longer find ways to cope with it. Normal feelings of anxiety will pass once a stressful event is over but for someone with anxiety, those feelings continue in a constant state of stress. Their inability to cope with their anxious feelings may lead them to avoid certain situations or fail to complete important tasks. Someone with anxiety can be triggered by much more than normal situations where anyone would feel nervous. Any kind of random stressor can set off their anxiety and cause them to feel panicked or upset. The person may know that their fears are baseless but they can’t control their feelings or their physical response. These physical symptoms can occur when someone has an acute stress response and may happen on a regular basis. Someone with anxiety will often experience these symptoms when they are not in proportion with the actual stressor. Their response to a certain situation may be so intense that they can’t follow through and instead avoid it altogether. For example, someone with normal feelings of anxiety might feel nervous before speaking in front of a group and have sweating or shaky hands but push through and finish their speech. Someone having a real anxiety attack will not even be able to make it to the podium. They will avoid the whole situation because their anxiety is so debilitating and they can’t cope with their feelings. People with normal anxious feelings don’t necessarily need to see a therapist if they are able to manage their nervousness and still participate in stressful situations. Those with anxiety will need to attend treatment or speak with a therapist about the things that they are going through. They need to learn coping mechanisms to help minimize their symptoms and may benefit from having medication to reduce their physical response. A therapist can help someone with anxiety learn to confront many of their fears and try to find strategies to handle an anxiety attack. Techniques like deep breathing, mindfulness and other tools can help anxiety sufferers to reduce their symptoms. If you or someone you know has issues with anxiety, contact a therapist or treatment center that can help you handle the symptoms.